GTU CCC Most Useful Material Download. Gujarat Technological University, Ahmedabad conduct CCC Exam Only for Government Employees. The examination is divided into two parts one is Theory and second is Practical. 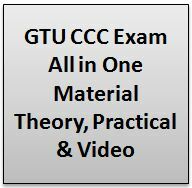 Most Important GTU CCC Material to prepare exam as follows like theory question, practical paper and video. If you like material, please share it with all friends. Thanks to Babu Patel (Edusafar) For This Video.